16" Circle S Roping Saddle With Suede Leather Seat! Includes Roping Warranty! 15" CIRCLE S 5PC PACKAGE Barrel Saddle Set With Feather Tooling on skirt! 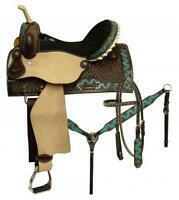 16" Double T BARREL Style Saddle With Brown Filigree Seat & Floral Tooling! 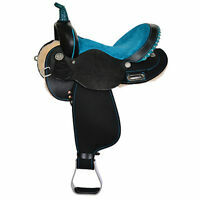 15" Double T Western Barrel Style Saddle With Floral Embossed Suede Seat! 12" Double T Youth Barrel Style Western Saddle W/ Cross Design & Rhinestones!